With new discoveries in the nature and better communications between researchers our understanding of earliest life forms on Earth has evolved rapidly. For over hundred years the Cambrian period was considered the first phase on the history of life on this planet. The spectacular discovery of Chamia in England's Charnwood Forest in 1957 convinced most that there indeed was life already in pre-Cambrian periods. Our knowledge of Ediacaran life today includes a most interesting gallery of life forms that was been found in 1967 in the well-preserved ash layers of Mistaken Point in Newfoundland. Such well preserved pockets of geological strata where remains of ancient lifeforms have survived exceptionally well are called Konservat-Lagerstätten. They are Divine Natural Reserves created by our God for us humans so that once we have learned enough we can see and admire what He has done! The Ediacaran Period, named after the Ediacara Hills of South Australia, is the last geological period of the Neoproterozoic Era and of the Proterozoic Eon, immediately preceding the Cambrian Period, the first period of the Paleozoic Era and of the Phanerozoic Eon. Its status as an official geological period was ratified in 2004 by the International Union of Geological Sciences (IUGS), making it the first new geological period declared in 120 years. 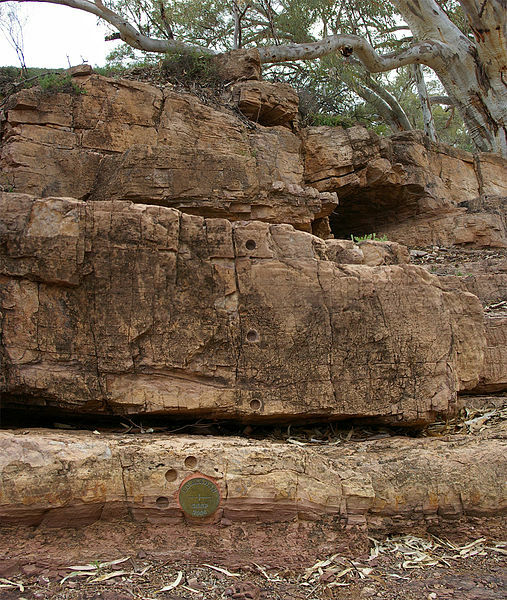 Although the Period takes its name from the Ediacara Hills where geologist Reg Sprigg first discovered fossils of the eponymous biota in 1946, the type section is located in the bed of the Enorama Creek within Brachina Gorge in the Flinders Ranges of South Australia. Click here for a large size copy of this wonderfully clear geological image of the crucial rock strata in Flinders Range used in official classification of Ediacaran period. Ediacaran period (635 - 542 Mya) is a geological phase preceding the amazing Cambrian explosion of life. It begins after fifteen million years of Snowball Earth or Marinoan glaciation (650-635 Mya) during which the entire planet was covered by ice and snow, not just the North and South Poles as today. 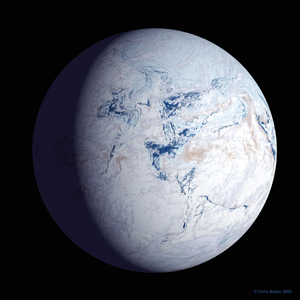 And yes, there has been discussion about the possible connection between the Snowball Earth and the early signs of life that appear after it in Ediacaran. The Ediacara (formerly Vendian) biota consisted of enigmatic tubular and frond-shaped, mostly sessile organisms which lived during the Ediacaran Period (ca. 635-542 Ma). Trace fossils of these organisms have been found worldwide, and represent the earliest known complex multicellular organisms. The Ediacara biota radiated in an event called the Avalon Explosion, 575 million years ago, after the Earth had thawed from the Cryogenian period's extensive glaciation, and largely disappeared contemporaneous with the rapid appearance of biodiversity known as the Cambrian explosion. Most currently existing body-plans of animals first appeared only in the fossil record of the Cambrian rather than the Ediacaran. For macroorganisms, the Cambrian biota completely replaced the organisms that populated the Ediacaran fossil record. "Enigmatic tubular and frond-shaped, mostly sessile organisms" like the DickinsoniaConstata in the picture above. Sessile organisms are animals that are not able to move around but stay put were they were born no matter what. They are enigmatic because zoologists and paleontologists find it very difficult to link them to other species. And they are strange because it seems that they were almost totally wiped out before the explosion of life began in the Cambrian period. The organisms of the Ediacaran Period first appeared around 585 million years ago and flourished until the cusp of the Cambrian 542 million years ago when the characteristic communities of fossils vanished. The earliest reasonably diverse Ediacaran community was discovered in 1995 in Sonora, México, and is approximately 585 million years in age, roughly synchronous with the Gaskiers glaciation. 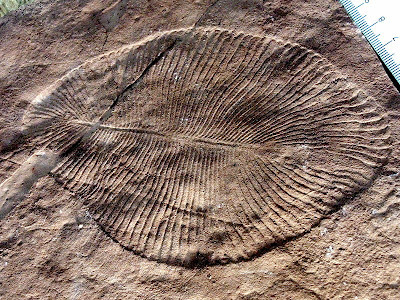 While rare fossils that may represent survivors have been found as late as the Middle Cambrian (510 to 500 million years ago) the earlier fossil communities disappear from the record at the end of the Ediacaran leaving only curious fragments of once-thriving ecosystems. Multiple hypotheses exist to explain the disappearance of this biota, including preservation bias, a changing environment, the advent of predators and competition from other life-forms. Fossils of such early life forms in pre-Cambrian sea are found in microbial mats not that different from modern day algal-mats found in the nature. Microbial mats are areas of sediment stabilised by the presence of colonies of microbes which secrete sticky fluids or otherwise bind the sediment particles. They appear to migrate upwards when covered by a thin layer of sediment but this is an illusion caused by the colony's growth; individuals do not, themselves, move. If too thick a layer of sediment is deposited before they can grow or reproduce through it parts of the colony will die leaving behind fossils with a characteristically wrinkled ("elephant skin") and tubercular texture.